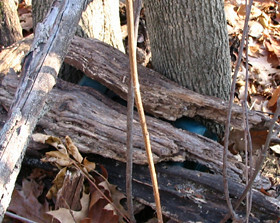 Here it is, geocache find number 2! Found this one less than two miles from my house. Considerably different than my first find. 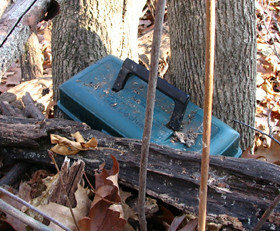 This tackle box was well hidden and filled with a lot of stuff. I estimate at least 30 people signed the log book and exchanged stuff. 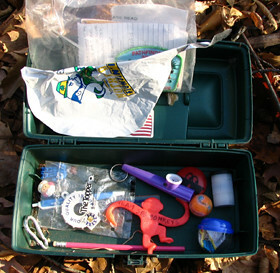 (I should mention, you can take stuff from the cache as long as you leave something in return.) Pretty cool. I'm looking forward to placing some caches of my own with some of my art... should be fun. Obviously this photo was taken just before the snow fell.